Seedcorn maggots are soil-inhabiting, yellow larvae about 1/4 inch long. They feed on newly planted soybean seed. The adult flies prefer to lay their eggs in fields containing freshly decaying organic matter. 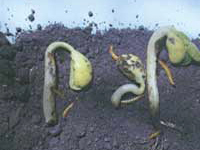 Damage is most likely to occur during a cool, wet spring when seed germination is slow. True white grubs are occasional pests of soybean seedlings. 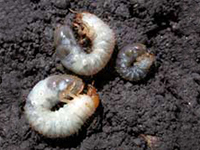 True white grubs are the immature forms of scarab beetles (May/June beetles) while annual white grubs are the larval stage of the masked chafter and Japanese beetles. Soybean fields formerly in sod or some other cover crop, or in set-aside the previous season are at higher risk of white grub infestation. Two or more live May/June beetle grubs per cubic foot of soil prior to planting may signal a potential problem. There are several species of cutworms, all with a wide host range, including soybean. Most cutworms overwinter as pupae in the soil or as young larvae, however some move into the midwest as moths from southern latitudes. 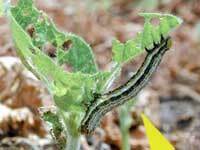 Late-planted and/or weedy fields are at higher risk for cutworm infestation. 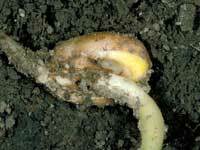 Young cutworms feed above-ground at night or on cloudy days. Older, larger worms tend to remain below the soil surface, and often cut plants above, at, or below ground level. Soybean fields likely to be infested with wireworms are those in which sod or small grains were grown the previous year(s), were in set-aside, or which have a history of wireworm damage. Two to three weeks before planting, establish bait stations in suspected wireworm fields. The weevils are found on soybean in late June to early July, when they feed on leaf tissue and smaller veins. Their feeding causes a ragged, scalloped leaf border and tends to be found mainly on field margins. The adult weevils are small, mottled gray in color and do not fly. Japanese beetles are found in the more southern areas of the region. They are easy to identify with their metallic green and copper-coloring, about 3/4 inch in length. They feed mid-June through August. 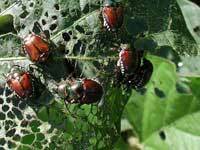 Japanese beetles can be voracious feeders but tend to congregate in certain areas. Be sure to scout the entire field to determine the extent of the damage. 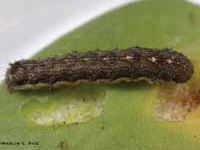 The soybean looper is a caterpillar about 1 1/4 inches long that moves with the characteristic looping movement. 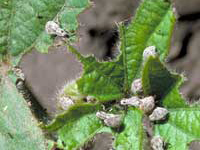 It is a sporatic feeder on soybeans, usually found mid-July to mid-August. The larvae eat leaf tissue, leaving irregularly-shaped holes between the veins. 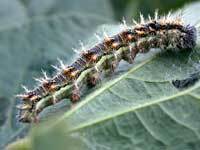 Thistle caterpillars are bristly, black and yellow larvae of the painted lady butterfly. They feed on soybeans in July and August, causing minor defoliation. The second generation will feed on the top layer of leaves and will web the leaves together with silk. 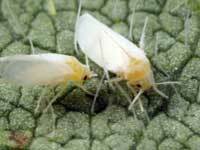 Whiteflies are tiny white flies and powdery wings that are common pests of greenhouse plants. They are minor pests on soybeans that can be confused with soybean aphids. Be sure you can distinguish between the two insects.